Autocue, teleprompting, prompting. Rarely the first service on the production managers list, and yet, it’s a piece of equipment which when paired with a professional operator, will transform your presenter-led shoot. While most people in video and television production now understand the basics of how an autocue works, it is worth bearing in mind that there are a number of different styles and sizes to consider for different uses. 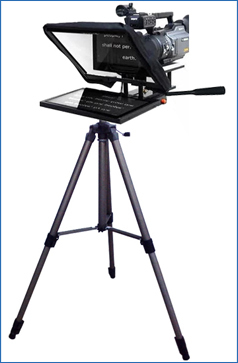 These range from small, lightweight monitors mounted above the lens for handheld work or jib shots, through to iPad systems, more standard 15” sized professional units for tripods, and large 20” units suitable for mounting directly to Vector heads and box lenses on pedestals. These days there are very few camera rigs that cannot accommodate some form of prompting monitor. Arguably the most important, and yet often overlooked element of Autocue, is the software that actually generates the script. There are again a range of options, from iPad autocue apps, simple display extension options from a laptop, to professional video conversion boxes with dedicated hand controls and numerous HD-SDI outputs. For anything other than the simplest of scripts, you will require live editing, easy navigation and clear formatting options. If the presenter is struggling with a sentence or particular word, the operator needs to be able to change it there and then. This is especially true for live television; the results of a vote or quiz will directly affect the entire script the presenter needs to read – often with very little time to make the necessary changes. Of course, the autocue software is only as good as the person working it, and the importance of a good operator cannot be over-emphasised. The operator not only adjusts the speed of the script in line with the presenter (they do not control the speed of the presenter), but also notices typos, writes difficult words phonetically, plans ahead to make sure complex pieces are easy to read and listens intuitively to the presenter and everyone in the studio or gallery to ensure the script is correctly updated, which in real terms can mean sometimes just moments ahead of when the presenter needs to speak the words. If you are shooting a simple piece to camera with a straightforward script, an iPad autocue app is a usable option, particularly if you are working with a small budget. The lack of a variable speed control or easy script editing however, may hamper you in the long run and actually increase the amount of time you are shooting for. If your budget allows, the cost of a professional operator with quality dedicated equipment, can mean that the presenter can focus on their performance as opposed to the script and the camera operator/assistant can focus on the shots and lighting, as opposed to rigging equipment they are not used to. • Use as large a font size as possible to reduce eyes ‘scanning’ across the text. Ideally 3-4 words max per line – but check with the presenter to find out what they are comfortable with and the director and cameraman to check for actual scanning. • Always balance the camera to compensate for the weight of the prompt unit – most professional autocue hires will include counter-balance weights. • If this is your first time using autocue and you’re going the iPad DIY route then test beforehand and build in testing time at the start of your shoot. There are many ‘free’ trial versions of autocue software, but from our experience they are notoriously flakey so its worth having at least two different programmes available that you know work. 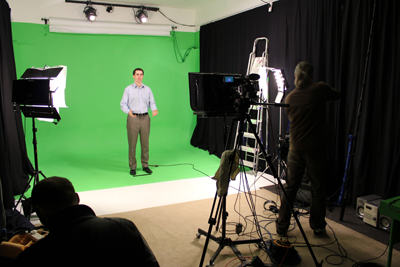 For studio shoots where the material will be edited later and when budget is tight, the iPad option should work. If you have a lot of material and different presenters during the day, we recommend investing in a professional service. Not only is it one less thing to think about, but it will almost certainly reduce the stress of the shoot. In any live filming environment get a professional in. In any live filming environment get a professional in.